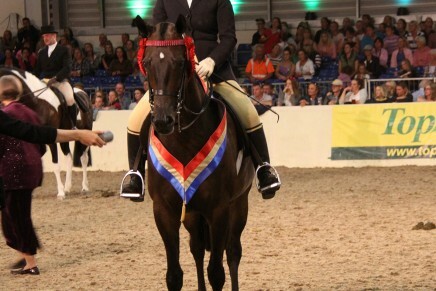 THE Wednesday Evening Performance at this year’s Equifest proved an emotional one for Lincoln-based Amy Bosworth. Riding the six-year-old novice Sharlen Royal Enclosure, Amy first captured the Amateur Hack, then the Amateur Part Bred before going on to head the prestigious Supreme Amateur Championship. On loan from Lauren Jowers, Amy has ridden Sharlen Royal Enclosure since the end of April and has been delighted with their progress in such a short space of time. 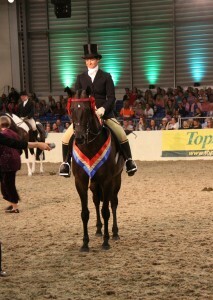 Ridden by Jess Nevin, the attractive bay took the Intermediate Championship at the Great Yorkshire Show earlier this year. The fantastic result was added to just a couple of weeks later when Amy headed the Part Bred Arab class at the Royal Internationa Horse Show and they have also qualified for HOYS in the Small Hack section. Said Amy: “He is such a star, tonight he has been brilliant and just went better and better I couldn’t have asked for any more. Olivia and Maude – Equifest Winners! Harry Hall’s Yard Visit programme, launched in June, is going from strength to strength.